SNES Mega Man 7 (JPN) in 37:14.38 by parrot14green & vsmk3. Here we see Rockman destroy Dr. Wily's army yet again, only this time on the SNES. 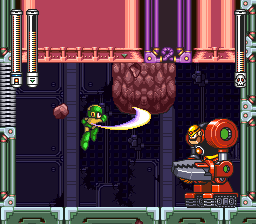 You would think poor old Wily would learn from his past 6 mistakes, however this isn't so. On the up-side, we get another superb TAS of this famous series. This is an improvement of approximately 71 seconds of in-game time, some of which comes from bug exploitation. This version plays on the Japanese version of Rockman 7 whereas the previous version played on the North American version. This change affects times outside of the player's control, but still gets counted towards the movie's length.